Is it possible to retro fit PAS to an 85 T3? I've just bought a Gipsy and it is a little heavy for the missus to steer! Compared to the Bluestar that we've got its like a tank and I wondered if its possible to install it on the Gipsy. If I can, is it easy to source the bits and what sort of cost are we looking at? 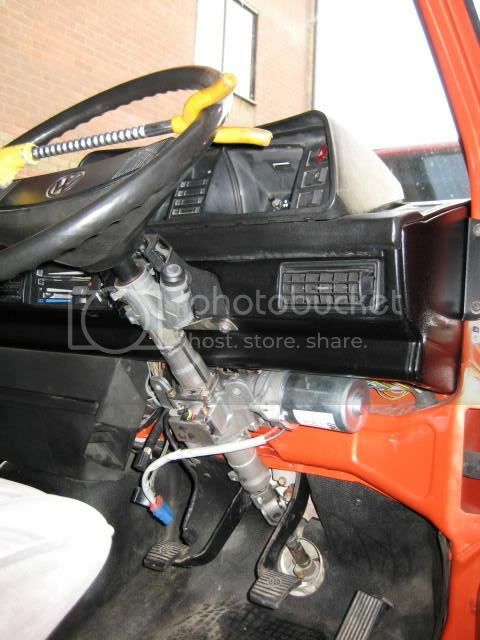 Fitting power steering to your van is a relatively simple and straight forward exercise. Obtaining a right or left hand drive power steering rack will be the only hurdle. They are about, however available at a price. NW_VW is flogging a RHD kit at £ 750 in the for sale section. LHD seem to be available at a slightly more acceptable price. I paid £ 350 for a pump, reservoir, reconditioned rack but no pipe work about 3 years ago. Spent another £ 80 on hydraulic hose and fluid. Took a day for me to fit. I'd say it was the best mod I have completed on the van. I have 235mm tyres and a Gti steering wheel and turning at low speed is a piece of piss. LHd set up for sale on 80-90 . Cheap aswell at £450 for complete lot. ZF !!! PPHHH !!! TRW is the way to go man !!!! BCS Crap Surfer of the year 2007 !!! Thanks for letting me know there's one for sale, I've checked and he says its for petrol engines, not diesels? Don't know whether it matters and presume its to do with the pulleys that power the pump? Can someone enlighten me as to the difference between ZF and the other one mentioned please cos I haven't a clue. Did TRW make the T3 rack? Original T3 racks are made by ZF ? I contacted ZF UK and they told the T3 power rack is now obsolete. I've got a LHD rack that needs re-con and JX Td pump/pulley/brackets if you are interested? Also WBX pulley/pump available.PM please. I converted both my rhd petrol t3 and lhd diesel t3 to electric powered column from a vauxhaul. Well worth the trouble and I now dont know how I managed with heavy standard stearing. If you are ever in bristol give me a shout for a test drive. The system I built is also road speed sensitive so you only get power when parking or moving slowly. how easy is the electric conversion? Sounds like an interesting/cheaper way to go. might it be easier for an air cooled T3? Electric power steering conversion is very straight forward to install. I need to order some more parts to build road speed sensor. The kit is a diy job if you have good mechanical knowledge. If not I can build and fit the kit for you. No probs for air cooled. RJES have almost finished their bolt on electric power steering kit. I'm not sure if Richard has posted anything up on the website on this yet but he's a very helpful chap over the phone and it's well worth a phonecall. has anyone had one of these 'column asisst' conversions and run them for a significant amount of time/mileage???????????? By column assist, do you mean an electric powered column? As above I have fitted them to both of my vans and am awaiting parts to build a few more set ups for some of the local t3 owners. I drove a non assisted van the other day and couldn't believe how heavy std steering is when parking. The parts are easily swapped from std to assisted. I have been running mine for 6 months now. I estimate the cost to build and fit epas (electric power assisted steering) to be about £400 with road speed sensing included. All sounds good to me, but because I struggle to wire up the back lights on a bus can you give me a quick run down on the differences between the 'normal' PAS and the version that you've come up with. Really want it on the bus just need to get my head round how it works! Factory vw PAS has a hydraulic pump mounted to the engine with hoses running to the front of the van which join to the hydraulic power rack. epas is a powered steering column that uses a motor directly onto the steering column, no hydraulic lines, no pumps no oil. Just wires a motor and an ecu. The ecu collects info from sensors fitted to the vehicle and give assistance at low speed when the engine is running and the battery has enough power to drive the motor. I hope this gives a slight insight.